Monarch Beach’s golfers are encourages to bring their cameras to the No. 4 green. DANA POINT, Calif. – Robert Trent Jones II has long been one of my favorite golf architects and our far-reaching tour of the Pacific Northwest already included rounds at two of his courses – Chambers Bay and Poppy Hills — that have been especially newsworthy lately. 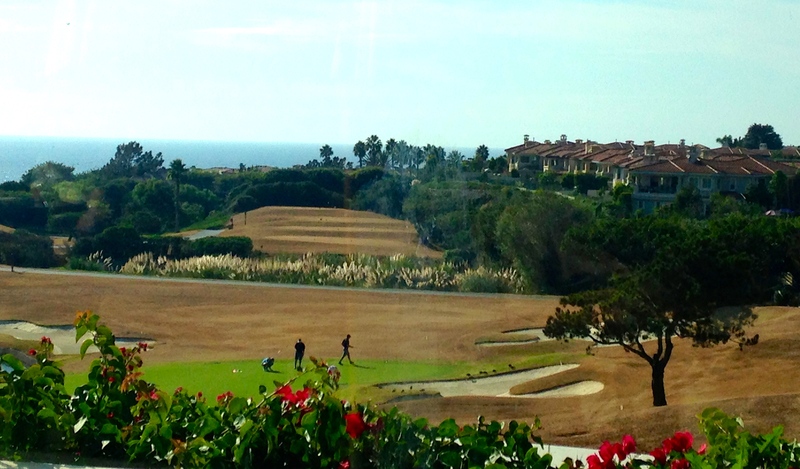 For that reason I suspected a round at Monarch Beach Golf Links might be a letdown. After all, it was one of Jones’ first courses and came shortly after the annual fall overseeding program had begun. There was no letdown, though. Jones has designed over 270 courses in over 40 countries and this early one – located roughly midway between Los Angeles and San Diego – is a testament to how well his courses have stood up over time. Jones’ headquarters are in California (Palo Alto) and his design portfolio lists 31 courses created in his home state. Some are more decorated than Monarch Beach, but that shouldn’t detract from the longstanding popularity the course has attained. 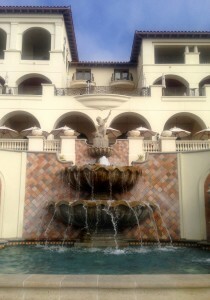 Monarch Beach Golf Links is now part of the St. Regis Monarch Beach Resort. The first nine holes of the course were built in 1983, the second in 1985. The resort didn’t open until 2001. After undergoing a $30 million renovation recently it’s certainly a luxury destination with its 400 rooms and assorted other amenities that are spread over 172 acres. Though in the overseeding process, the course provided the resort a dramatic backdrop. The course, though, is more than a major part of the resort. It’s a major part of the community as well. We played with two 30-somethings, both avid local players. They reported that — factoring in the cost, conditioning and other amenities — Monarch Beach may be the best golf value in Orange County. Assistant golf professional Jackie Kazarian said about 45,000 rounds are played at Monarch Beach annually, and they’re about one-third resort guests, one-third members and one-third community and tournaments. Only notable shortcoming is the absence of a practice range (there are some hitting bays with nets next to the putting green). Jones’ task was to build an oceanfront course in the mid-1980s and he succeeded in creating what is now one of just 11 oceanfront courses on the West Coast. 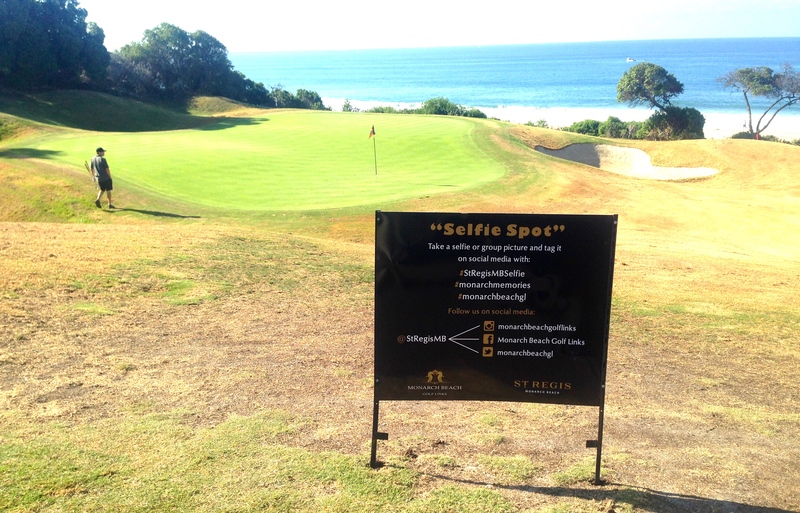 The dogleg left par-4 third hole provides the best view of the water, and that’s underscored by the fact that the course operators have posted a sign to encourage selfie picture-taking. Fountains, sculptures and distinctive architecture are all part of the St. Regis experience. The par-70 layout is a bit on the quirky side, with back-to-back par-3s on the front nine and three par-3s coming after the third and last par-5 on the back side. The course is unofficially broken down into three segments. Holes 1-5 comprise the Ocean Loop, Nos. 6-9 are the Canyon area and Nos. 10-18 are the Home Stretch. Golfers must contend with about strategically-placed 105 bunkers with lots of doglegs and elevation changes. Residential homes looming high above the course don’t come into play but do create a pleasant setting. Hiking trails intertwine with the cart paths in a few spots, but aren’t a distraction to the golfers. 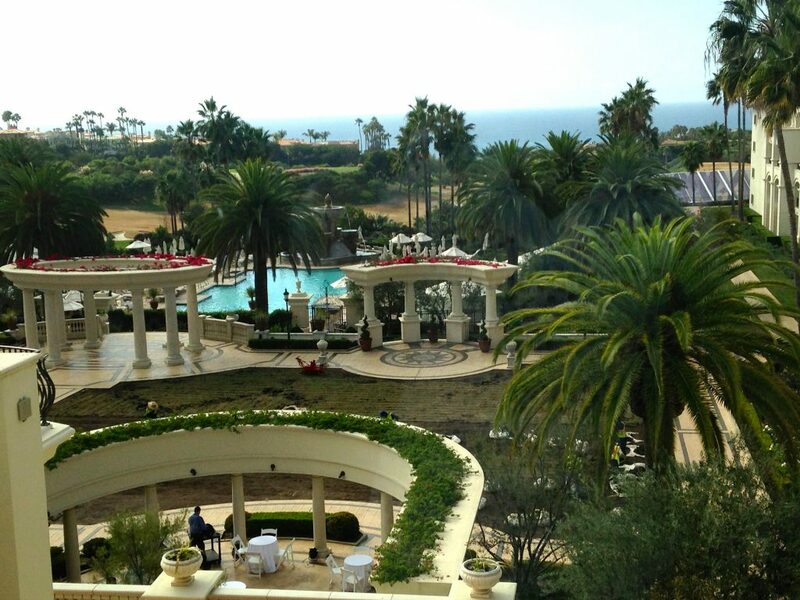 Monarch Beach has had its moments in the spotlight. It hosted the Hyundai Team Matches in 2001 and 2002 and The Golf Channel’s Matt Ginella declared Monarch Beach “Best Ladies Golf Destination’’ in 2013. It was also listed among the Top 50 Women Friendly Courses, but don’t get the idea this is a layout that caters just to the ladies. At 6,645 yards (with a rating of 72.5 and slope of 135) from the tips it’s not a long course, but it presents a fun challenge for players of all ability levels. There are four tee placements, the shortest being at 5,050 yards. The third may be the prettiest (and no doubt the signature hole), but the seventh – a par-5 that stretches to 612 yards from the back tees – is a true No. 1 handicap hole. Not only is this dogleg left the longest hole on the course, it’s a strategic and mental challenge as well. Best of the five quite good par-3s is the shortest one. No. 13, ranging from 90 to 155 yards, has water guarding the front, back and right side of the green. The view from the fifth floor of the St. Regis Hotel was stunning.